Photos by Christopher Tack for the Tiny House Conference. Houses by Wishbone Tiny Homes (left) and Frank Belo. Over the last 40 years, the average home in the United States has increased in size by more than 1,000 square feet, essentially doubling the amount of living space per person since 1973. But a decade ago, in the midst of the housing boom and explosion of outsized, luxury home construction in American suburbs (i.e., the "McMansion"), a quieter, smaller movement began to gain attention. The idea of building quality homes of less square footage but with truly used spaces began to take hold. This concept, sometimes referred to as the "Not So Big House" approach to residential design has ignited a trend that reflects the state of the U.S. economy, the still-struggling housing market and a growing conservation ethic to reduce and reuse. Welcome to the Tiny House. A so-called "Tiny House" makes the average 2,600 square foot American home look and feel like a home twice that size. These micro homes measure, on average, from 100 to 400 square feet, but they can be as small as 80 square feet or as large as 700 square feet. Often resembling studio apartments, tiny homes can be crafted in many styles and customized to personal tastes. Although these houses are small, they are big enough to include the needed amenities of a home. There’s a sleeping area, a bathroom, a modern kitchen, storage and spots for eating and relaxing. In most cases, the structures are aesthetically-pleasing, often so much so that they’re worthy of photo spreads in glossy housing magazines. While most tiny home owners live alone, the structures can be built to accommodate couples and even families. A small visitor poses in the front yard of a tiny house (called the Minim House) in Washington, D.C. The idea of living small, really small, is catching on. Tiny house communities are multiplying, and approximately two out of every five tiny house owners are over age 50. Tiny house converts and fans are hosting events and how-to workshops across the country. And builders and designers are catering to the demand. Tiny homes provide a viable living option for some older adults and offer communities new ways to think about housing. "The benefits of tiny homes are obvious," says George Chmael, the CEO of Council Fire, an Annapolis, Maryland-based consultancy that advises nonprofits, corporations, governments and communities on sustainable building practices. "There's reduced maintenance, a reduced financial burden and added movability and mobility for a change of circumstances." While each of those benefits is helpful to any homeowner, they're especially valuable for an older adult who isn't up to taking on major home maintenance work, is on a fixed budget and both wants and may need the flexibility to adapt to whatever the future brings. With many Americans spending one-third to more than half of their income on housing, living small uses significantly less of a paycheck or savings for putting a roof over one's head. According to a frequently-cited infographic from The Tiny Life, a website of resources devoted to living small, 68 percent of tiny house owners have no mortgage compared to 29.3 percent of all U.S. homeowners. 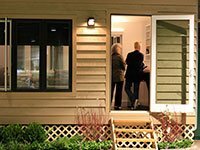 For someone who wants to spend time living at the beach, in his or her hometown and near scattered-about adult children, tiny houses can enable a person to be a multiple homeowner or — as it’s sometimes called — a "mouseholer" by having several small abodes, each ready and waiting in a different location. Living in a tiny space also means living with fewer possessions. "In a tiny house you have to consider every item you bring into your home," says architect Sarah Susanka, creator of the Not So Big House approach to residential design. "I tell people it's like living in a haiku. You have to be aware of every single thing you bring into your house. Tiny living really teaches you to live more freely. Everything becomes a treasure." Living small also requires a fundamental change in outlook. "What tiny houses really do is change the game in terms of your finances, your life, your time and the opportunities you have,” says Ryan Mitchell, founder of The Tiny Life. "It's really an activator to change your life. It focuses on the life you lead outside the house." Read an interview with Sarah Susanka, founder of the "Not So Big House" movement, about boomers and smaller homes. Living in a small space on a large parcel of land enabled Mitchell to leave his hometown in Charlotte, North Carolina, for a few months and live overseas, something he'd never have been able to do if he had mortgage payments. "My fixed costs are very low," he says. Also, because tiny houses can be moved, would-be homeowners have opportunities to set down roots in a place — or places — where an average-costing house could not be built. Part of the very definition of a tiny home is that it be constructed with environmentally conscious and renewable materials. Because of that tiny houses present clear opportunities for towns and cities looking for environmentally sustainable housing options. According to TinyHouseBuild.com, a resource website created by tiny house owners Andrew and Gabriella Morrison, who teach others how to build tiny houses, constructing the average new home consumes three-quarters of an acre of forest, or seven full logging trucks worth of supplies. In contrast, the materials required to build a tiny house can fit on a half of one logging truck. Tiny homes also save energy. The average American home needs 12,733 kilowatts a year to operate, which emits about 16,000 pounds of cardon dioxide per year. A tiny house uses 914 kilowatts a year of energy, emitting about 1,144 pounds of carbon dioxide annually. Some tiny houses are able to get their utilities, water and sewage services the way most other houses do by connecting to electrical grids and using public utilities, if the community or city will allow it. If not, tiny houses can receive their electricity from standard generators or solar panel systems — or a combination of the two. Water may come from a well or a rainwater capture/treatment system that also filters the collected water and heats it by a propane hot water heater. As for plumbing waste, the solutions vary. Some homes use composting toilets, which use the natural process of decomposition and evaporation to eliminate wastes; others rely on incinerator toilets, which burn instead of flush wastes. Some attach to septic systems or use a holding tank and removal system similar to that employed by portable toilet providers. Tiny houses can provide an affordable tool for combating homelessness by getting people off the streets and into their own space, thus offering them both shelter and a measure of self-respect. In Eugene, Oregon, a micro-housing community called Opportunity Village has 30 tiny homes that provide shelter for citizens in need. Each tenant lives in an 80-square-feet space and shares a common kitchen, community space and bathrooms. The homes were built by volunteers using donated materials and $100,000 in private donations. In Oakland, California, an artist transformed illegally-dumped shipping containers into wheeled shelters for homeless citizens. "A roof and a set of keys is 90 percent more effective than any other homelessness solution," notes Chmael, who has worked with cities on such issues. Tiny houses can provide temporary shelter. 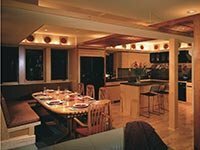 Reeling from Hurricane Katrina, communities on the Gulf Coast built so-called "Katrina Cottages," 300 foot, durable and attractive small homes that were designed as an alternative to the unpopular and often hard-to-obtain trailers being provided by the Federal Emergency Management Agency (FEMA). The cottages were hailed as not only a great solution to a crisis, but as desirable housing choice in general. Also, during a crisis, tiny houses have uses other than as homes. "Tiny houses can also be tiny clinics, tiny schools, or tiny labs that can be transported to communities most in need," says Wade Boarman, who works with George Chmael as a program coordinator at SustainaFest, an educational nonprofit that engages all age groups in sustainability issues. He adds that micro homes can be a viable option for military personnel in transition. Tiny homes can make use of unused land that can’t be zoned for regular buildings or homes. Chmael says he’s frequently approached by cities and communities that are looking for possible solutions to abandoned city lots. "Typically, cities tear down structures, clean up the spaces, then offer tax breaks to developers, who then reestablish communities," he says. "But this tends to be socially displacing. Maybe these structures offer another way to address urban challenges. Tiny homes don't require massive investment." Although tiny houses have all the basics — heat, electricity, water, a kitchen — they typically don’t have the luxuries many now consider to be standard home appliances, such as a washer and dryer, dishwasher, a full-sized stove and refrigerator-freezer. However, because they don't have such appliances, tiny house residents will seek out the services of local businesses. Many tiny homes (including this one in Washington, D.C.) have wheels and can travel. Since tiny homes don’t have a lot of room for extended food storage, residents are more likely to consume what they buy soon after they buy it, so fresh foods (such as from a farmer's market) are especially useful — and healthier, too. Since the homes rarely have washer-dryers, local Laundromats are used or laundry service providers are hired. The community benefits by having existing infrastructure (the Laundromat) used and jobs created (such as laundry pickup and delivery services). Over time the laundry costs to the tiny house resident could be the same or less than that of buying a washer-dryer and paying for the water, gas or electricity and detergents. Since tiny houses aren’t permanently installed to a site, they typically don’t require building permits and are often treated by law as a type of recreational vehicle. As such, in many communities a tiny house owner could place their structure in the yard or on the grounds of a property they already own or rent, or that of a friend or relative. Campsite and RV parks are also location options. Brian Levy, founder of Minim Homes, a firm that assists people who want to build micro homes, parked his own 210-square-foot tiny house — which sits on a trailer and was built for around $30,000 — in a vacant lot he bought in Washington, D.C. The space, which serves as a tiny house showcase, has room for multiple tiny houses and features a common fenced-in area with a vegetable garden, fire pit and outdoor dining area. Tiny house owner Lee Pera has organized community-building activities for the once-neglected space and leads tiny house design workshops. "Integrating places to live into an already existing community, and not isolating them," Pera says, could be valuable option for older citizens. "We're definitely seeing the interest" in the sold-out workshops she helps organize. However, due to local zoning laws, the tiny house owners in D.C. can't permanently reside on the lot. (All have residences elsewhere.) The lack of standard zoning for such structures can be a conundrum for communities, many of which don’t allow RVs to camp on city lots or even private spaces. "Also, it's hard to convince cities to give up tax money," says Mitchell, who’s written a book, Cracking the Code: A Guide to Building Codes & Zoning for Tiny Houses. "Building codes are set up in a certain way, and tiny homes often don’t fit into any one box." Mitchell believes that it’s only a matter of time before municipal governments are forced to figure out what to do with tiny-sized homes. Residing in so small a home would present logistical problems for people with extensive "stuff" — or collections, such as art or books, large pieces of equipment for their jobs, or hobbies that involve big objects, such as a piano or skis. Even though larger tiny homes are available and can be suitable for couples and families, not every household is good with that much togetherness, especially if there are other options. Take a look at several tiny homes, inside and out. A larger, farther-reaching plus, says Mitchell, is that the kinds of people who live in tiny houses are exactly the types of citizens communities need in order to thrive and flourish. "Tiny house owners tend to be more engaged in their surroundings," he says. "Consumer things are less of an issue. Relationships are more of an importance." By definition, if you live in a tiny home, some of your living has to occur outside your home, he points out. Tiny Houses can also serve an educational purpose, becoming a textbook of sorts for talking about sustainability issues and housing needs. Council Fire’s George Chmael, who also founded SustainaFest, has used tiny houses as a teaching tool for middle and high school students as part of his educational outreach. "We’re talking to them about living in 200 square feet or less," he says. "This is a very tangible way of calling up real issues: How much space do you need? How many things do you need to live comfortably? What is the American Dream? Do you really need a mortgage, three cars, the debt? What does success mean?" "Tiny houses used to be for people who wanted to live small and get off the grid, but no longer," says Chmael. "The coming years will give us a sense of how helpful these types of home can be. I have no doubt they have a role to play. I’m optimistic." Carol Kaufmann is a writer and editor whose work has appeared in the AARP Bulletin, National Geographic, Reader's Digest and The New York Times. She is also the author of the best-selling books Safari and Ocean, both produced by Workman Publishing. From the slideshow "Livable Communities Show & Tell"